One of Darrell Young’s campaign promises while he was running for sheriff earlier this year was that he would look for ways to save the taxpayers of Cannon County money. Sheriff Young has already delivered on that promise in several ways, including the installation of a mailbox at the Cannon County Sheriff’s Department. Previously the department received mail at a box at the Woodbury Post Office. Sheriff Young said the department will save $97 a year by having mail delivered. 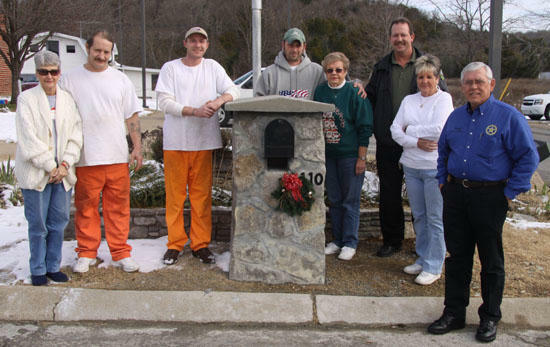 Trustys Patrick McCullough, Jason Couch and Tony Barrett constructed the mailbox. Pictured from left are Hilda Parham, bookkeeper, Barrett, McCullough, Couch, Martha Francis, cook, Ed Brown, jail administrator, Ruby Martin, cook, and Sheriff Young. This is something for the trustees to be proud of having built. It looks beautiful. What a beautiful mailbox and a nice addition to the Sheriff's Department grounds....having food gardens, plant gardens, the new mailbox will really save taxpayers money. Every penny does add up so keep up the good work Sheriff Young!!!! In the article, congratulations on the correct spelling of the word "trusty." GREAT JOB! GOOD WORK SHERIFF YOUNG! Keep up the good work Sheriff your doing an amazing job. What wuld REALLY save money would be to merge the Woodbury PD with the Cannon County PD..
Is Woodbury big enough to need 6 squad cars? Most of 'em just sit in the Woodbury PD parking lot gathering dust..
Would only happen under a metropolitan form of government. I knew my vote counted. You are a good man Darryl.. Keep up the good work. As a fiscal conservative I think a metro government might be a good move, but I have not done enough research to know for sure. Understandably I would not look for such a change to come from within our local governmental bodies. I think it is something that would only happen if enough citizens petitioned for a change. As with everything, I'm sure there are both pros and cons.